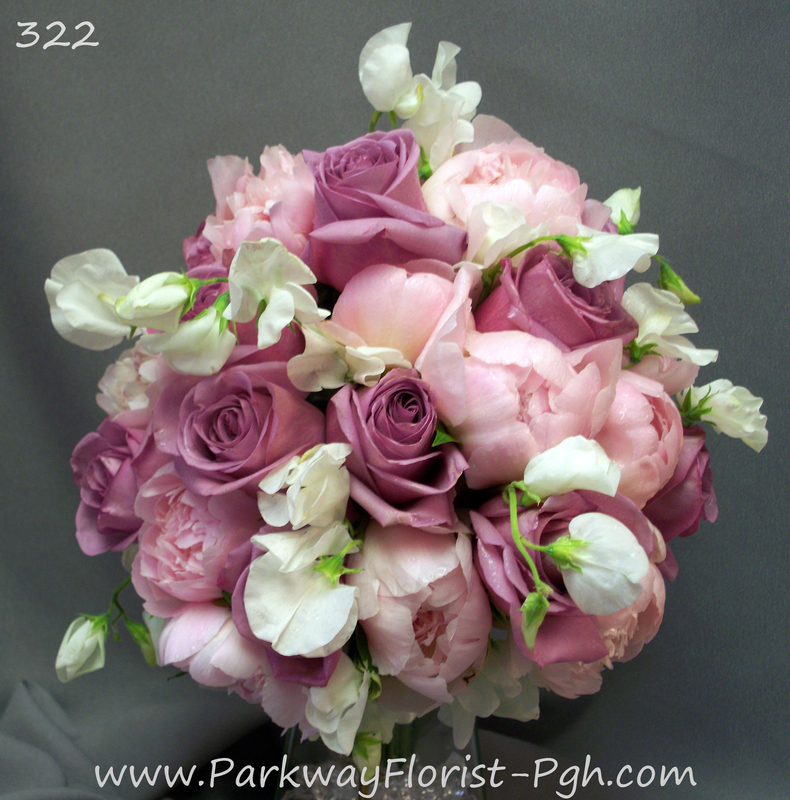 Last Saturday we adventured to Oakland with a truck full of flowers and smiles on our faces for a wedding ceremony that took place at Heinz Memorial Chapel on the University of Pittsburgh’s campus. 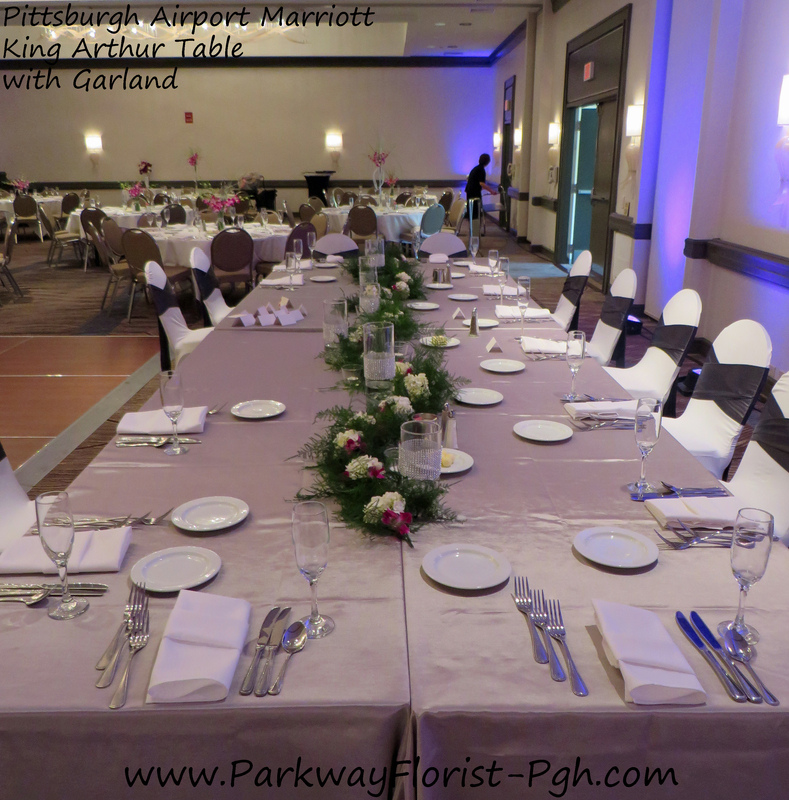 The reception that followed took place at the Carnegie Café which is a part of The Carnegie Museum of Art and Natural History. 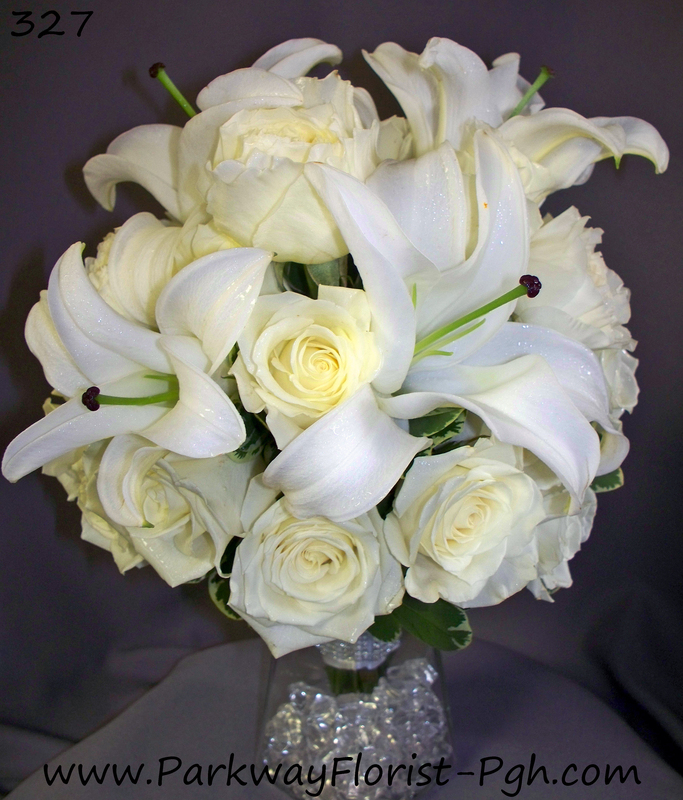 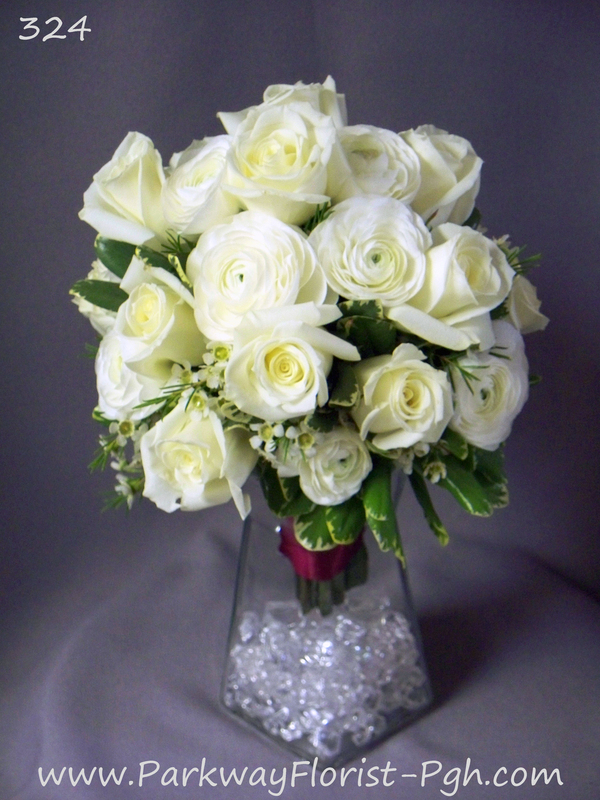 At the ceremony, the bride carried a cascading bouquet of white lilies, ivory roses, and white larkspur. 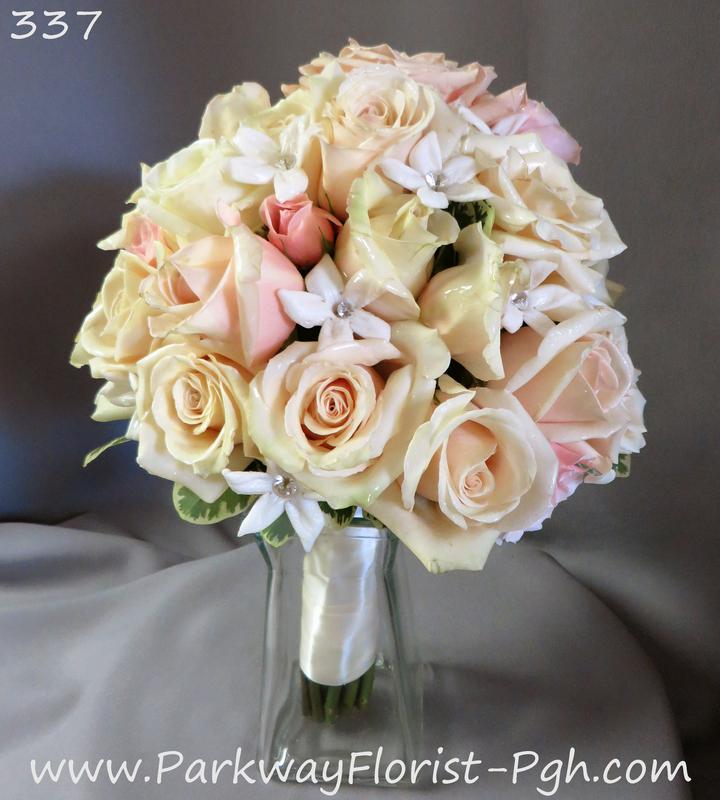 Her bridesmaid carried ivory and blush roses with light pink wax flower and fresh cinnamon basil as accents. 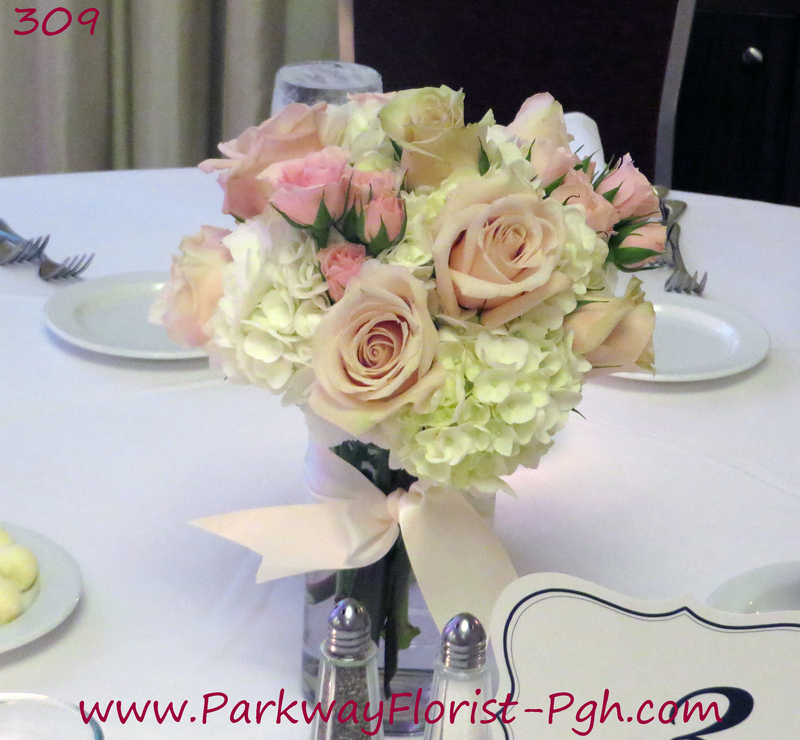 The adorable flower girl carried a clutch of three blush roses and light pink wax flower to match the bridesmaid. 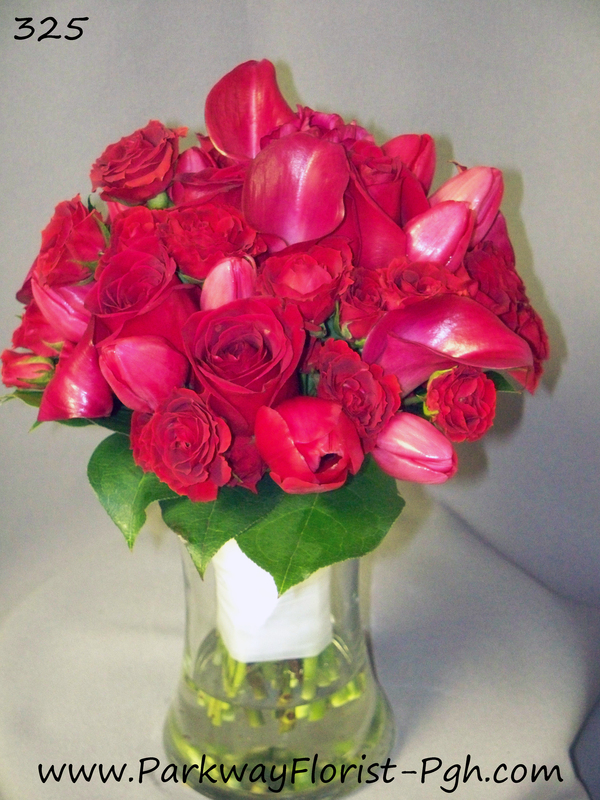 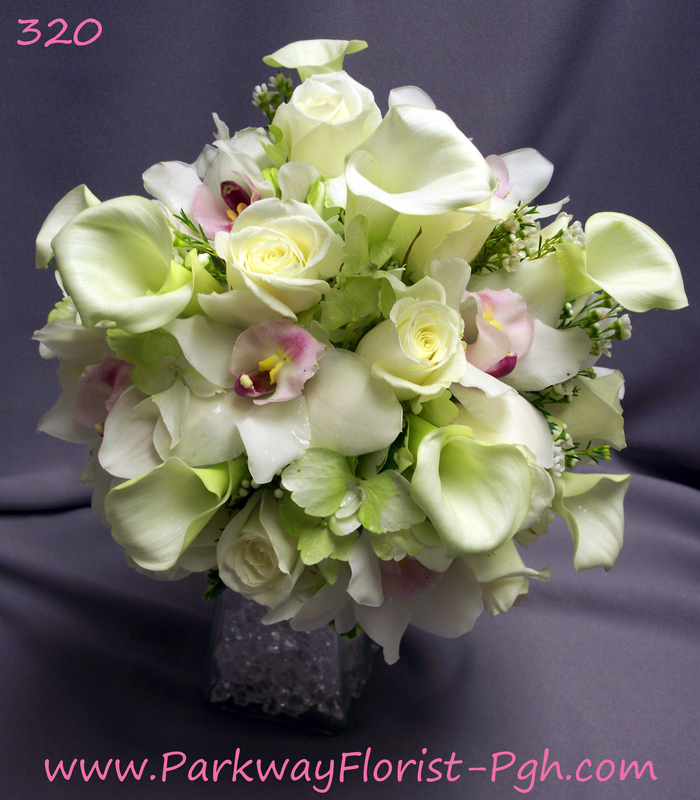 We supplied two arrangements with seasonal flowers to decorate the Heinz Memorial Chapel altar. 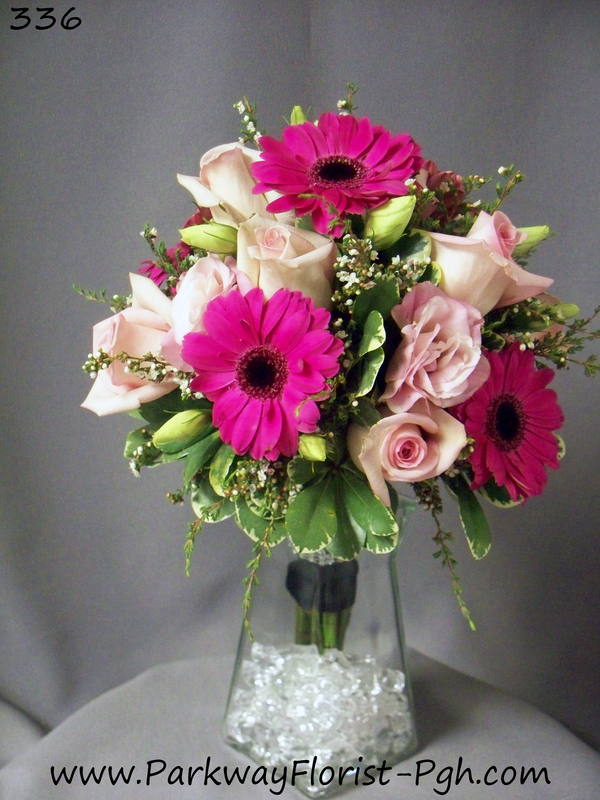 These stood out nicely against the rich wood tones in the chapel. 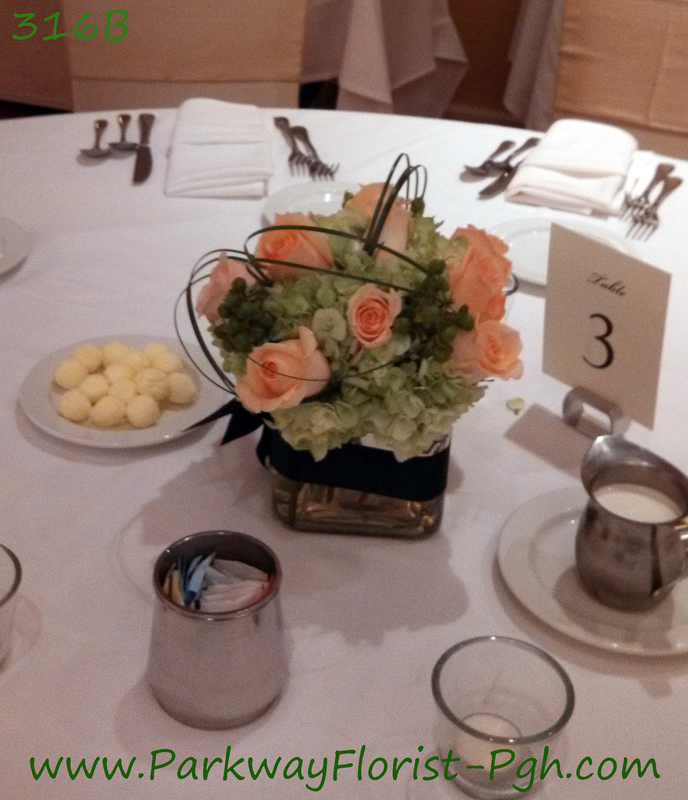 At the Carnegie Café we decorated the guest tables with a tablescape design which included satin pewter grey table runners, several collections of vases with floating candles for ambiance, blush and ivory centerpiece arrangements, sprinkled blush rose petals, and disbursed votive candles. 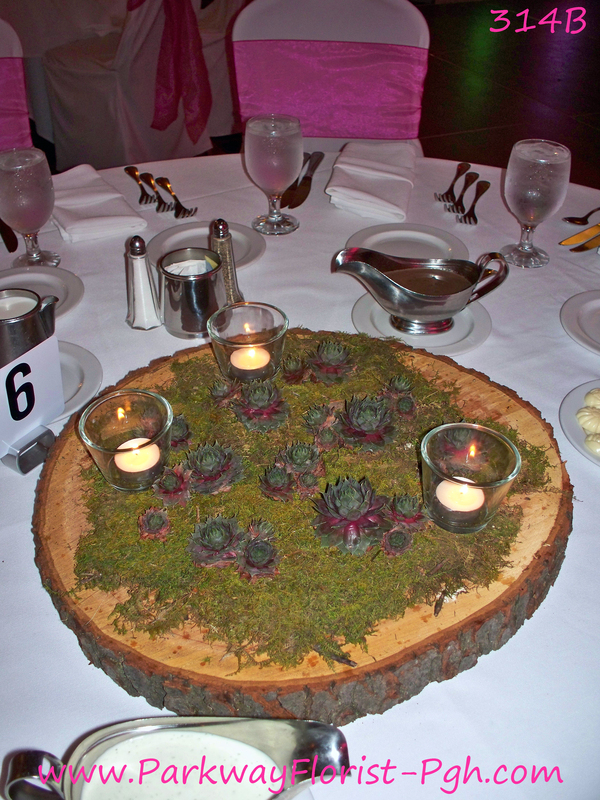 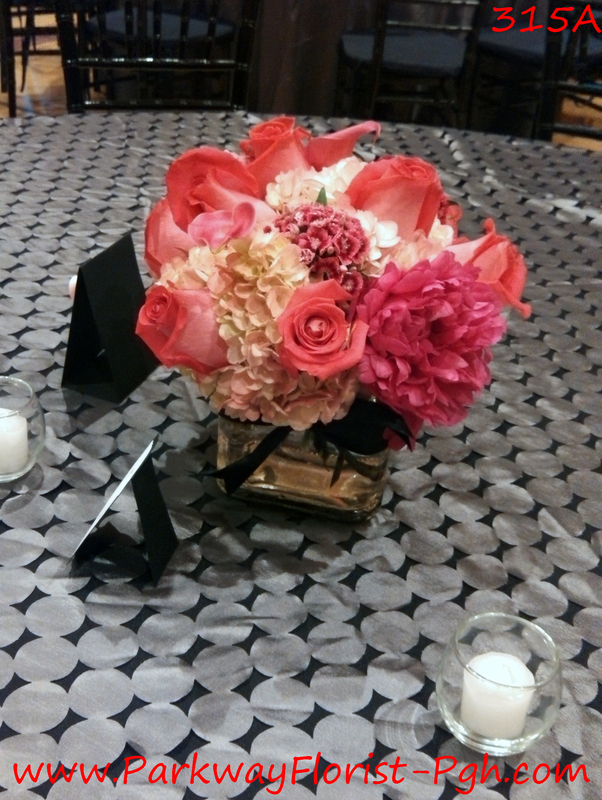 The centerpiece arrangements were lush and lavish. 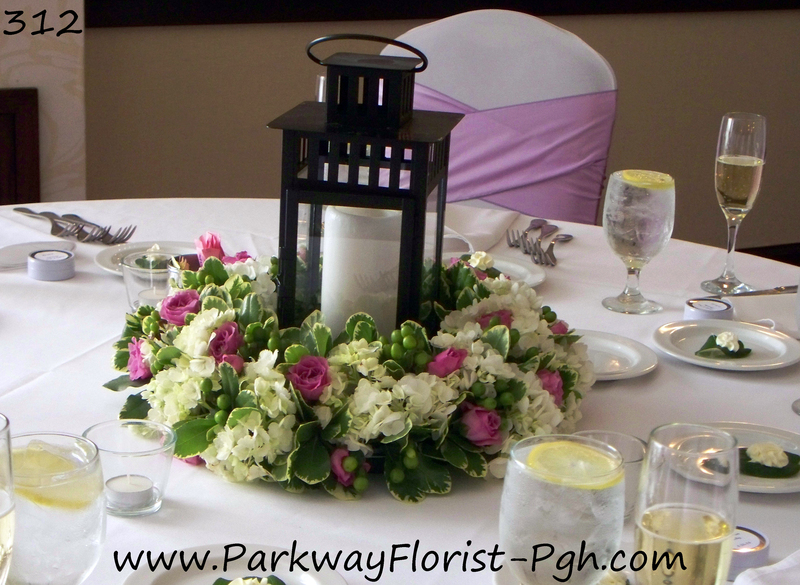 Designed in mercury glass pedestal bowls, they included white hydrangeas, blush roses, locally grown dahlias, fuchsia feather celosia, and coleus. 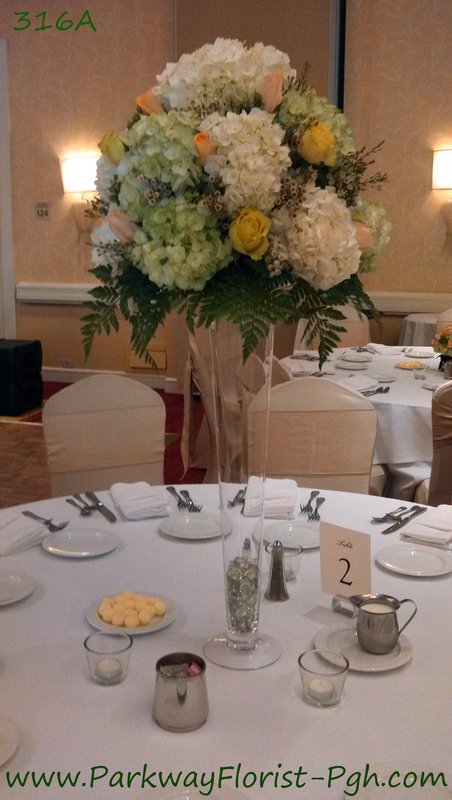 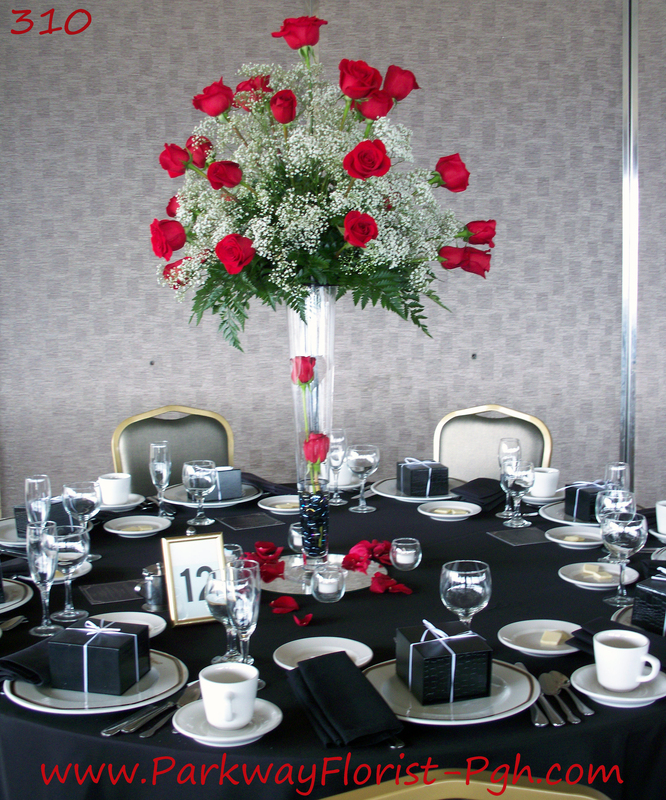 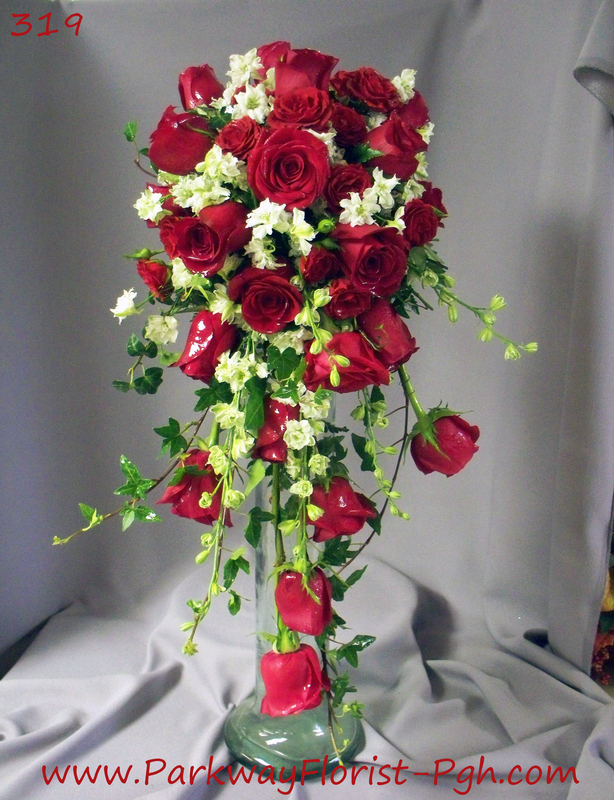 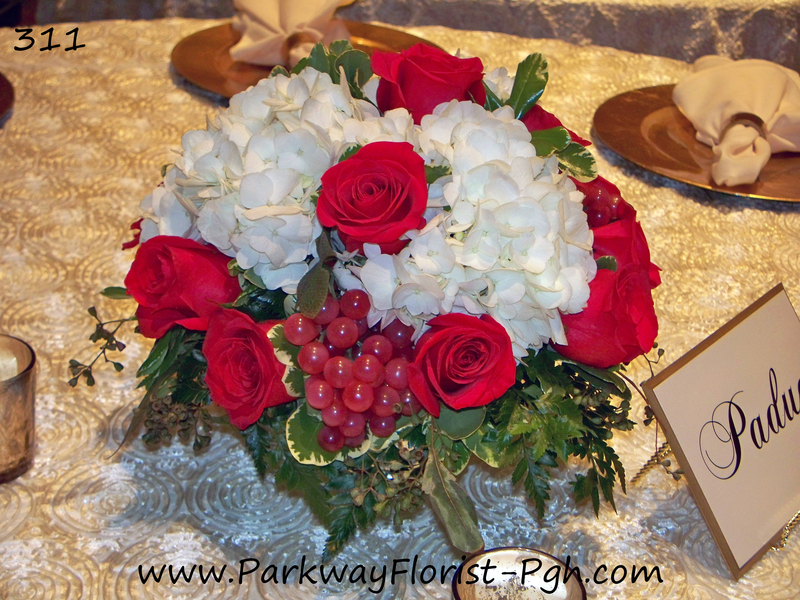 The sweetheart head table was decorated with a long and low centerpiece with coordinating flowers as well as the bride’s bouquet when she arrived at her reception. 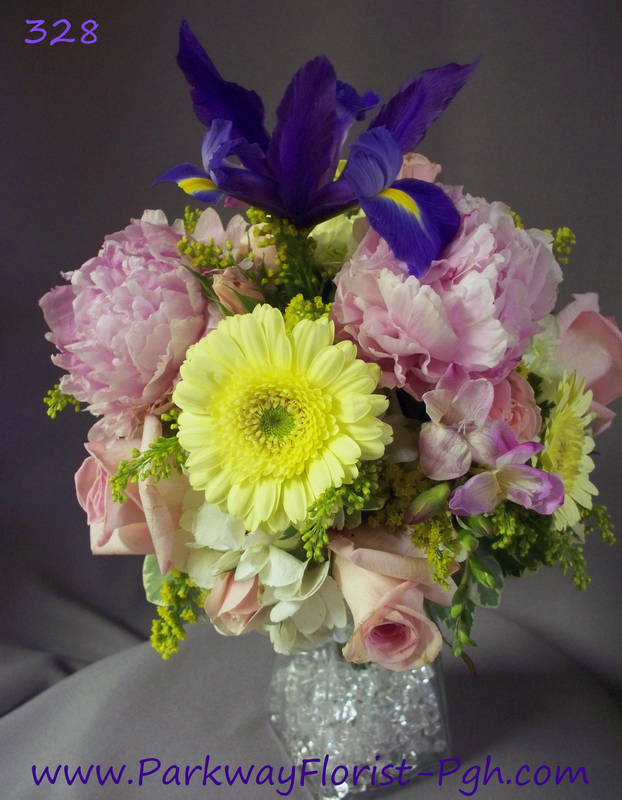 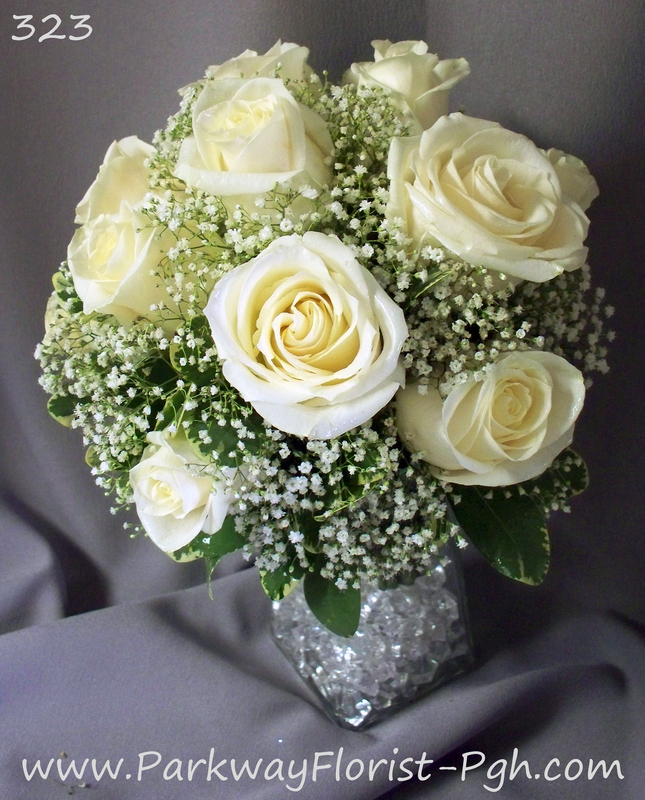 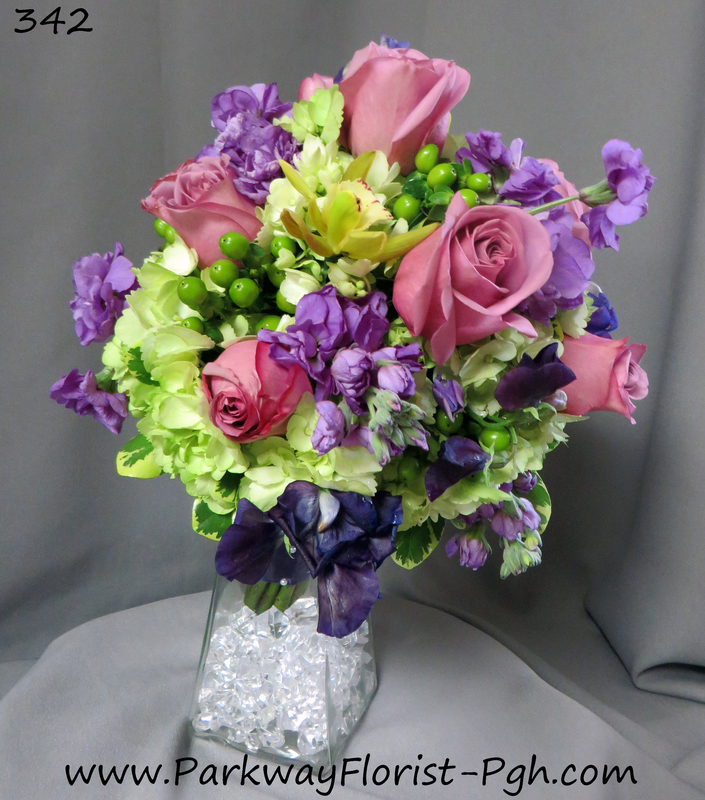 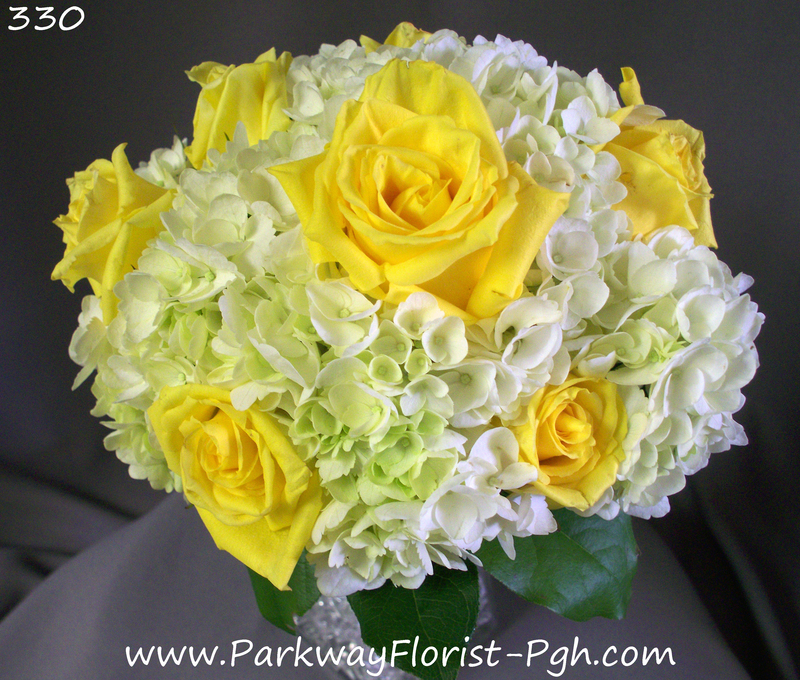 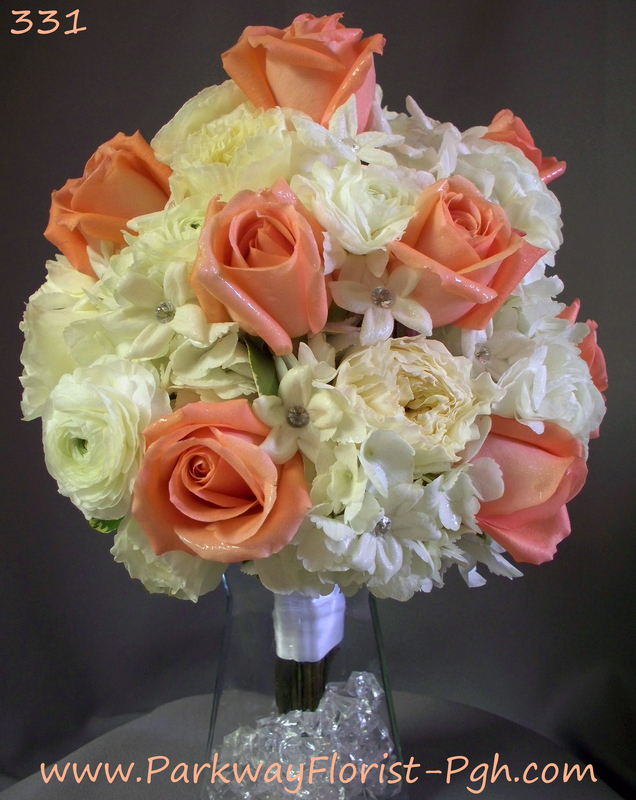 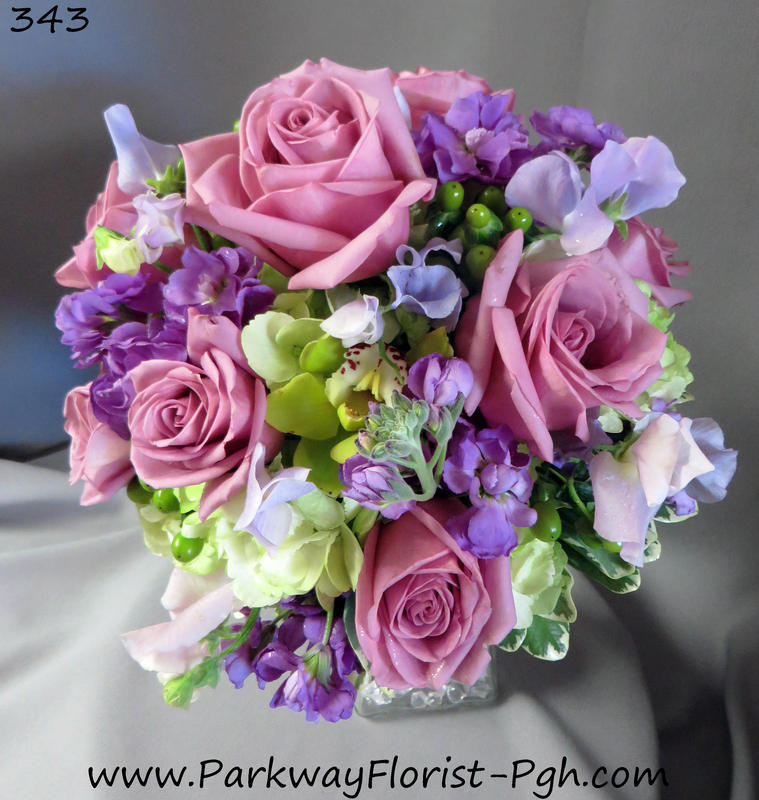 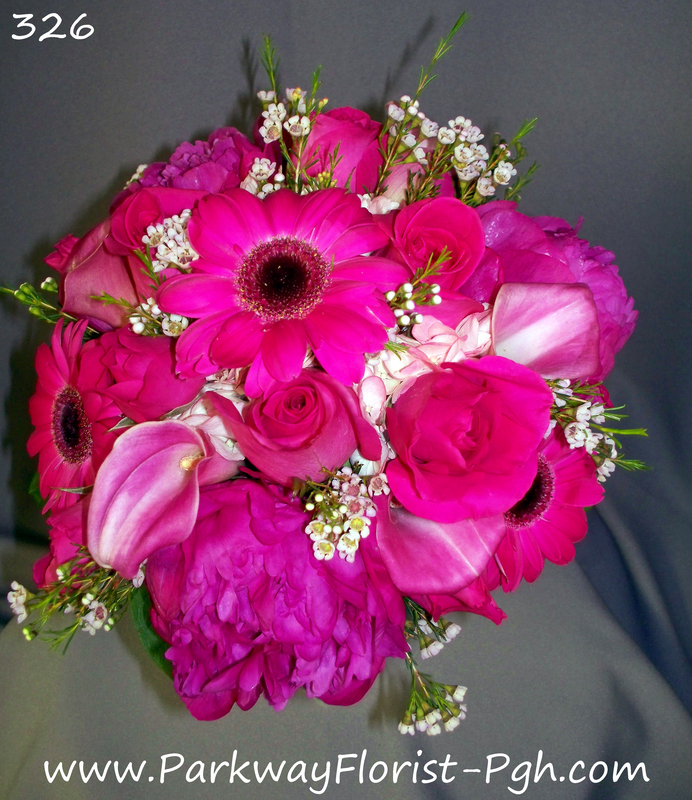 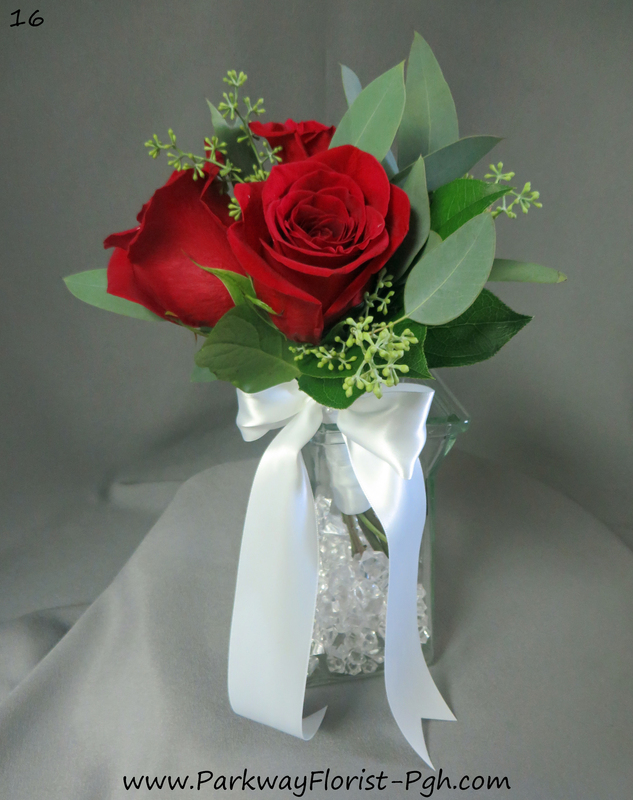 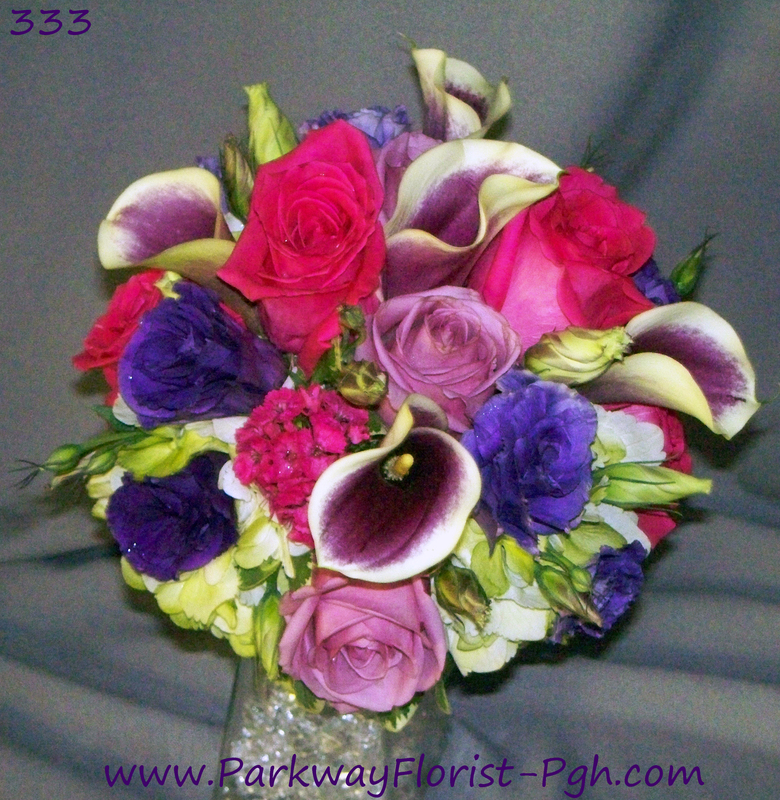 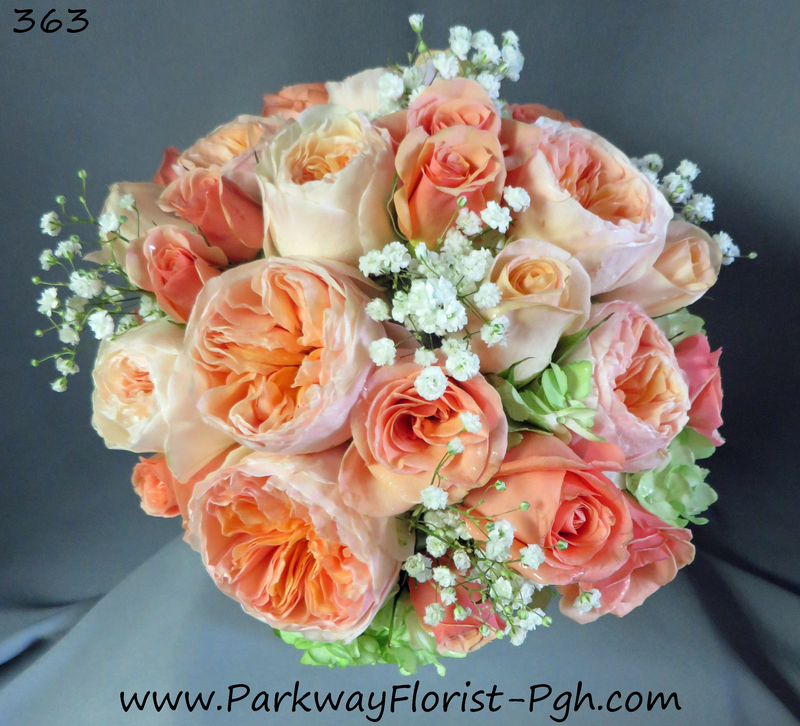 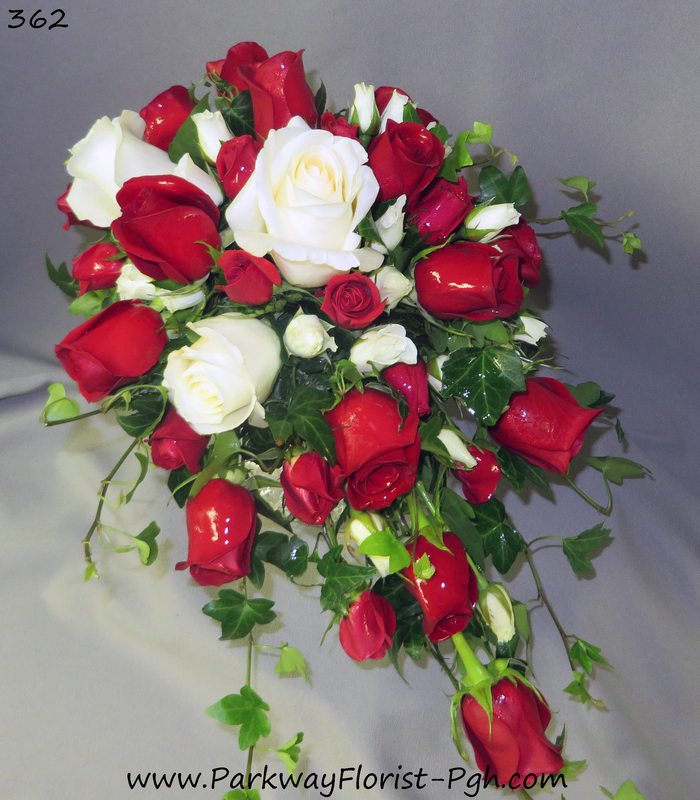 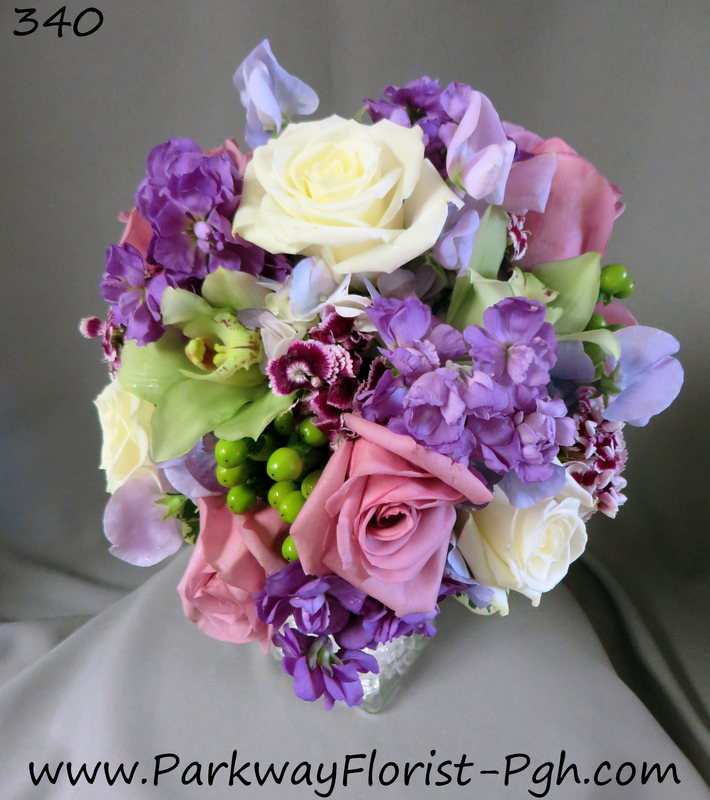 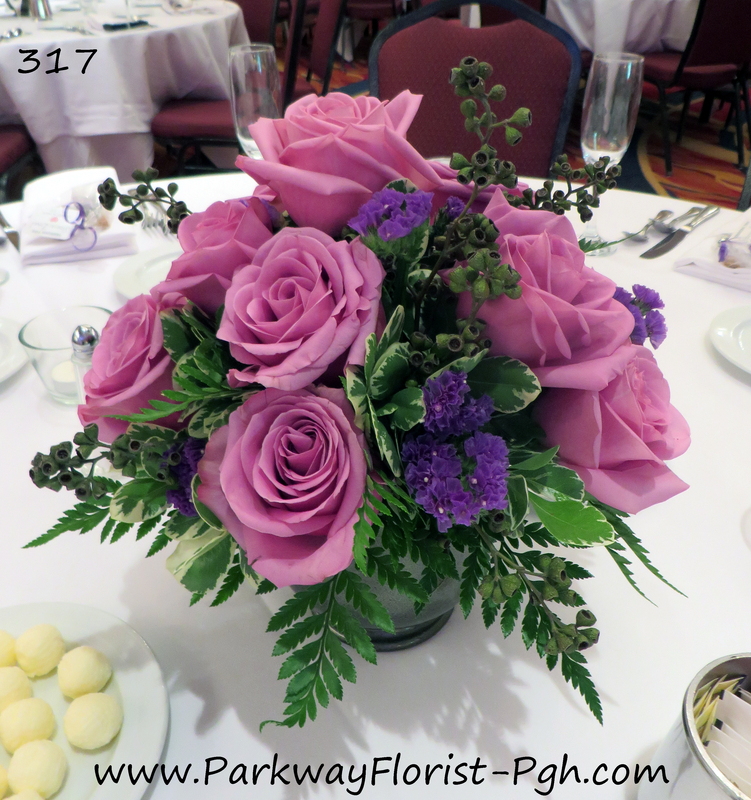 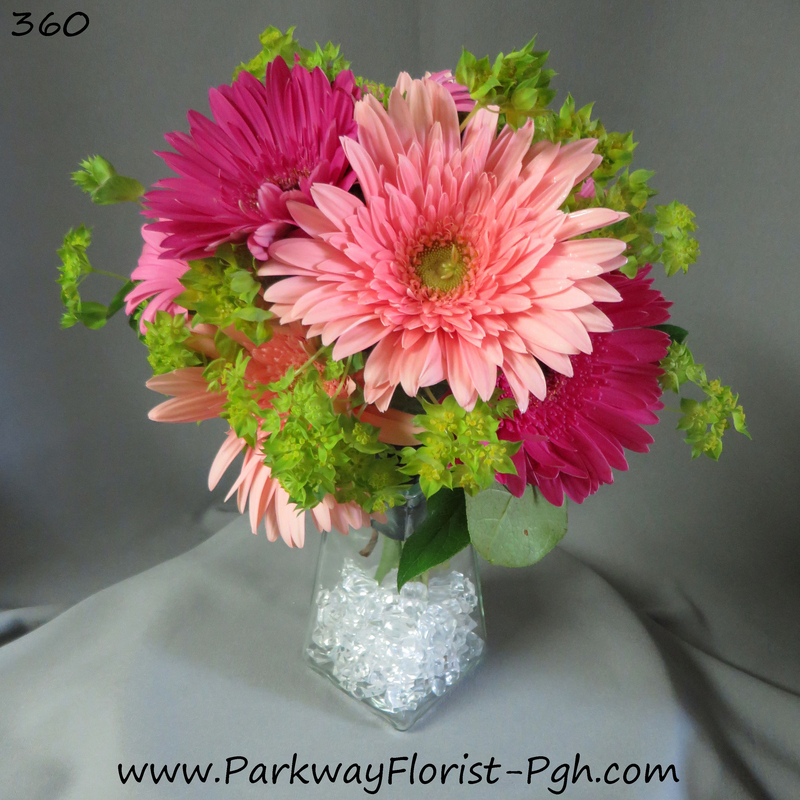 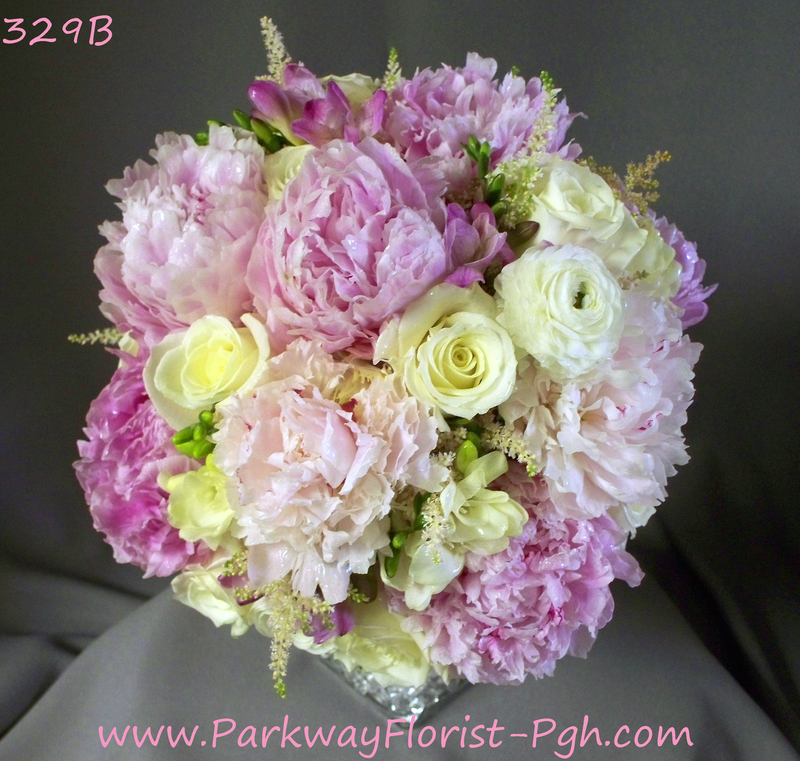 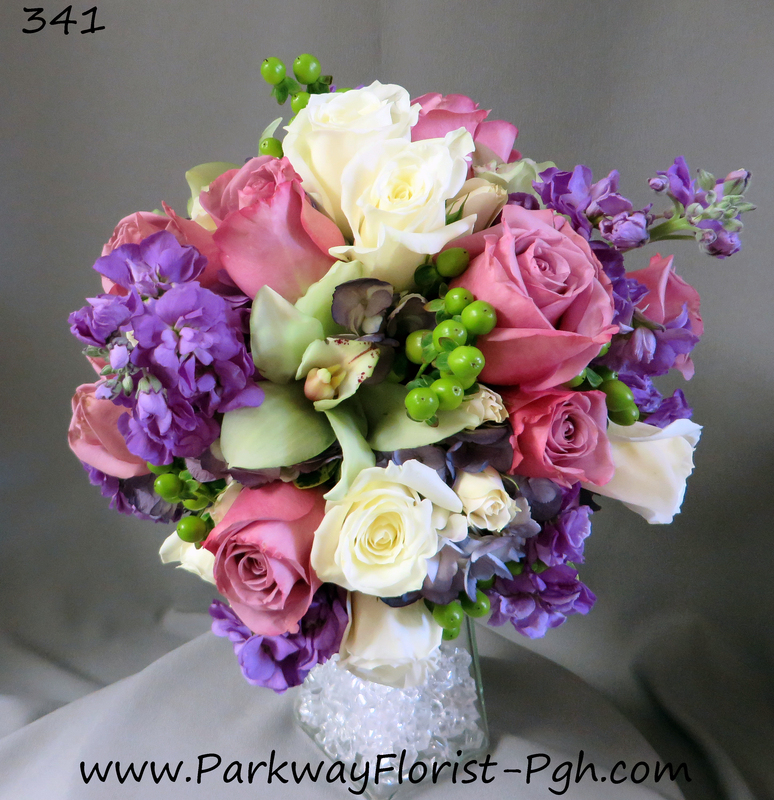 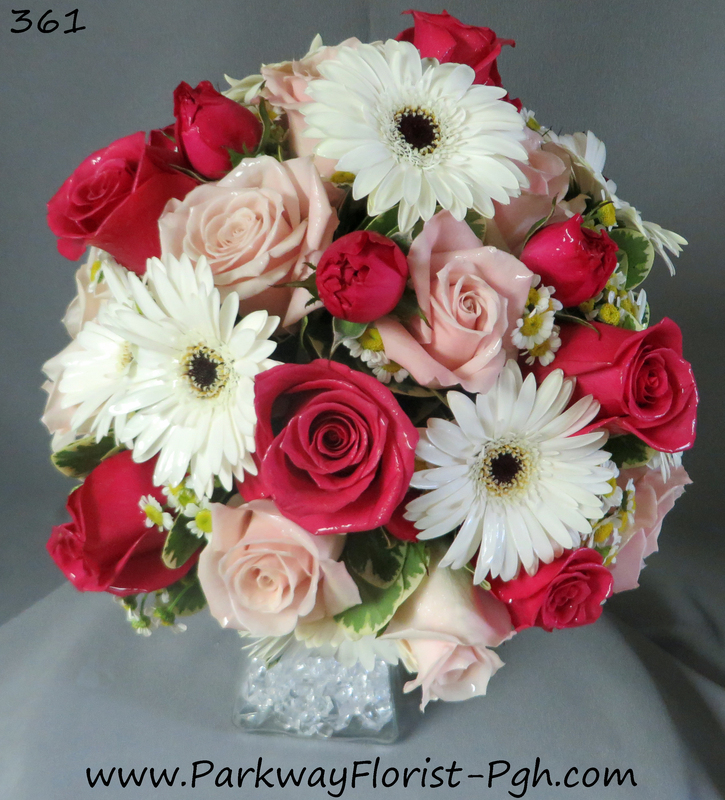 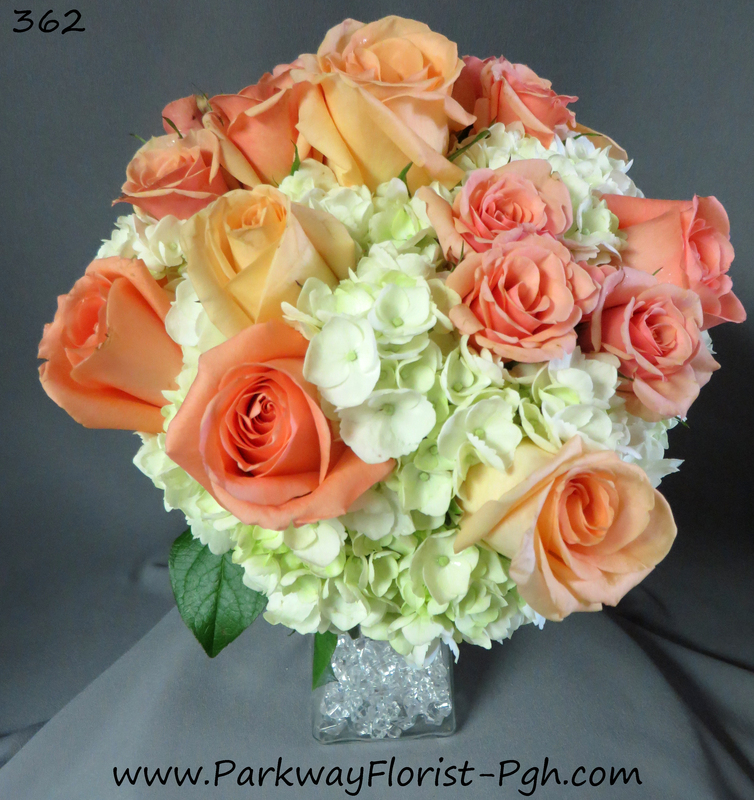 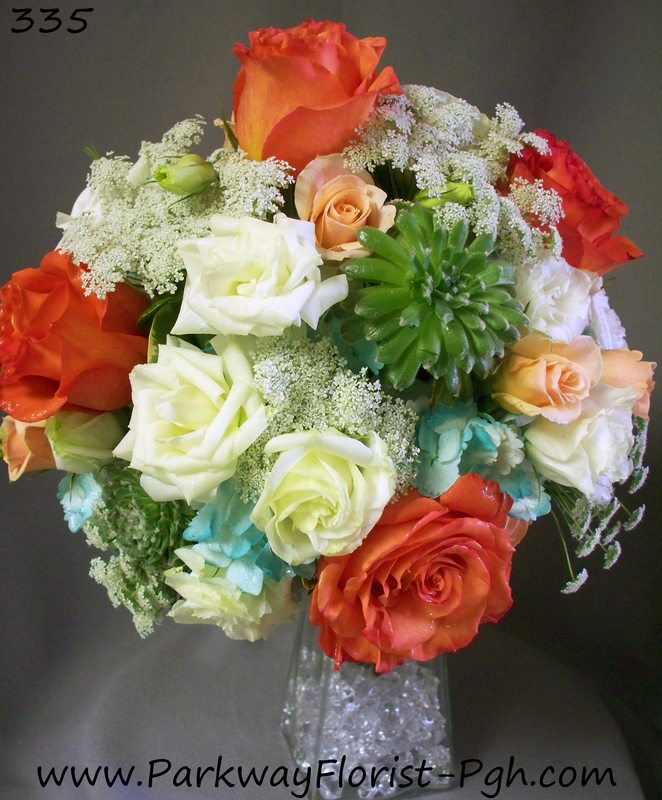 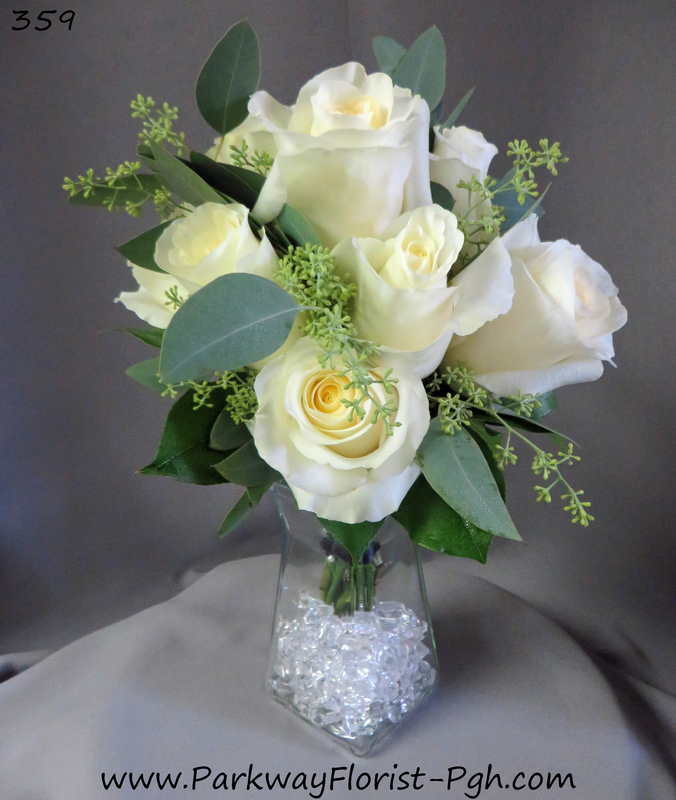 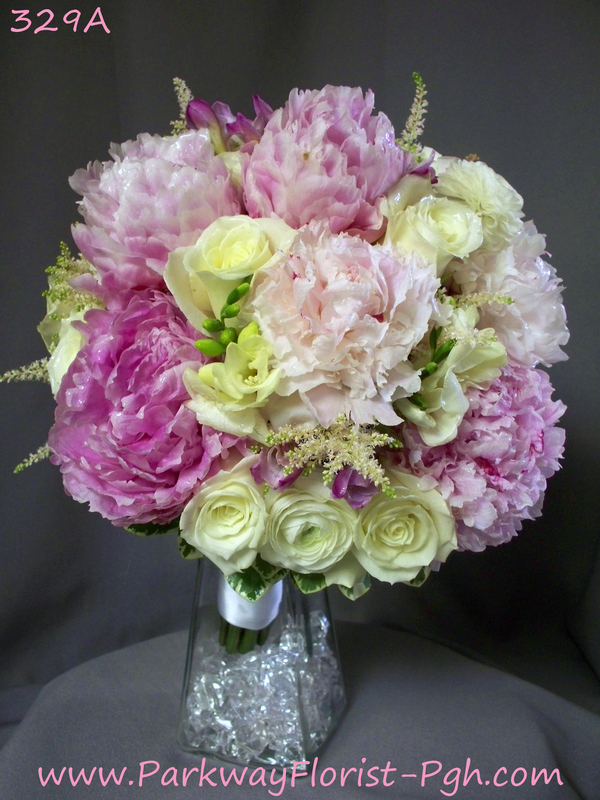 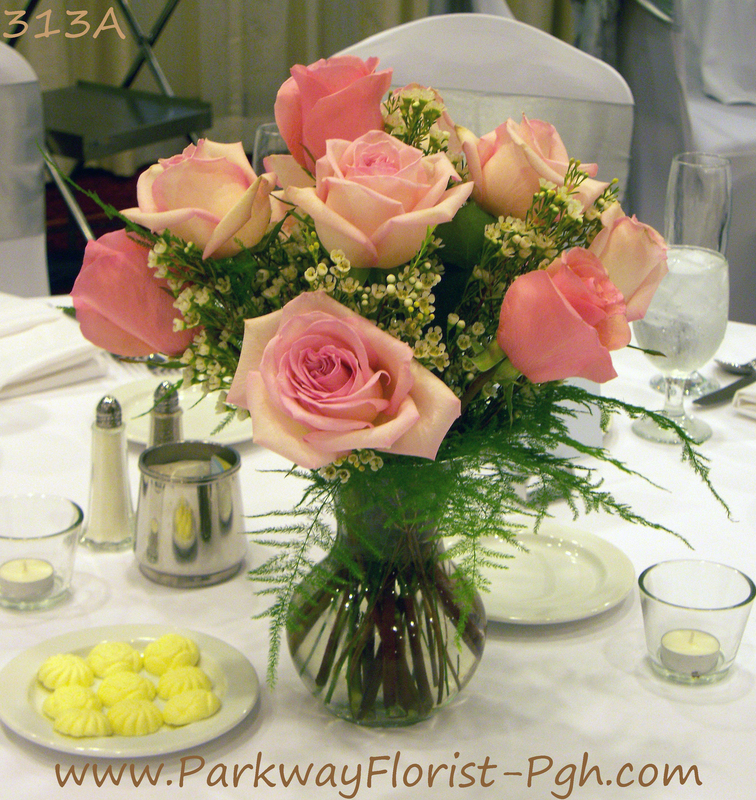 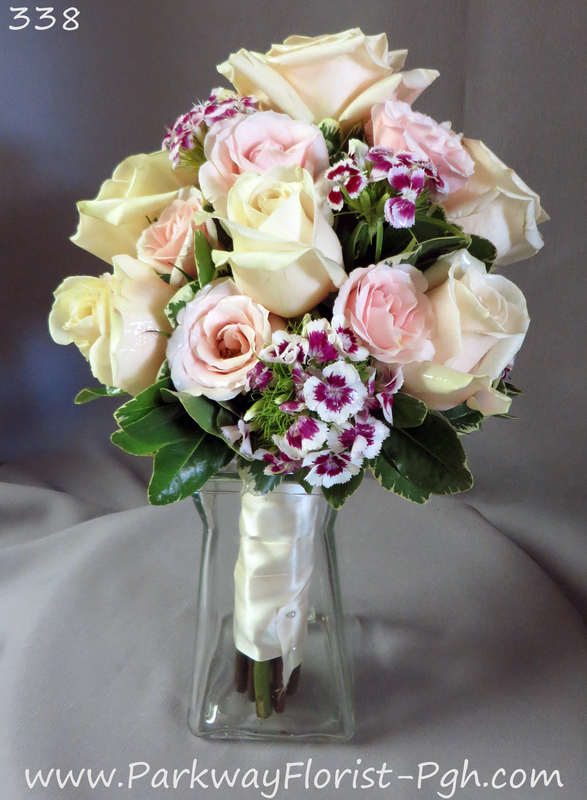 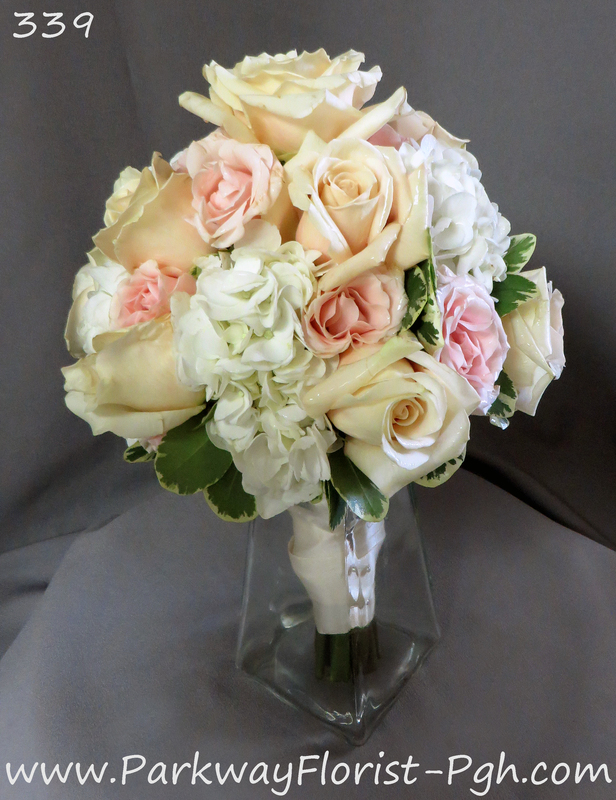 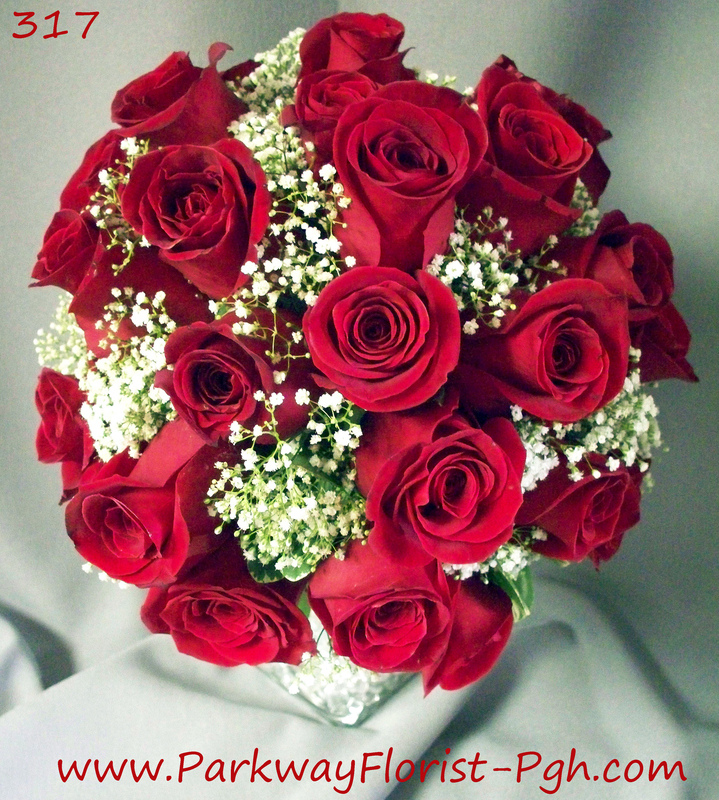 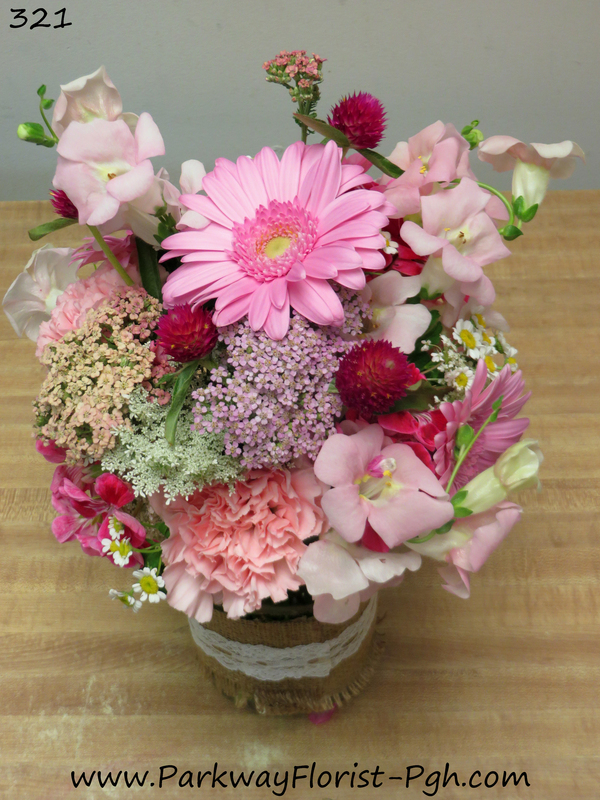 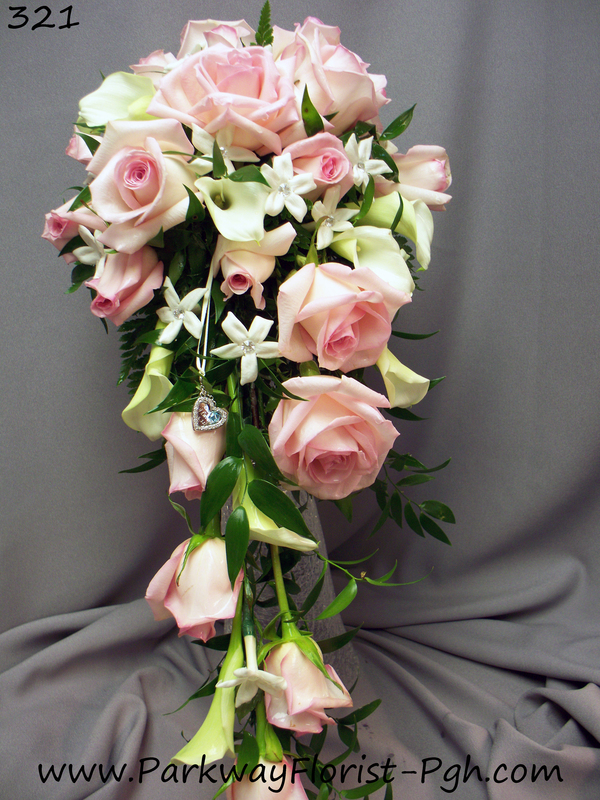 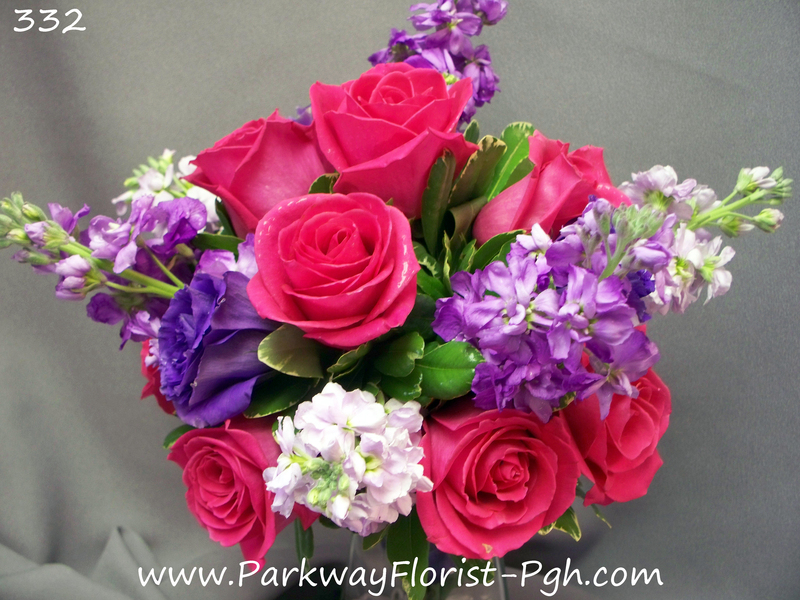 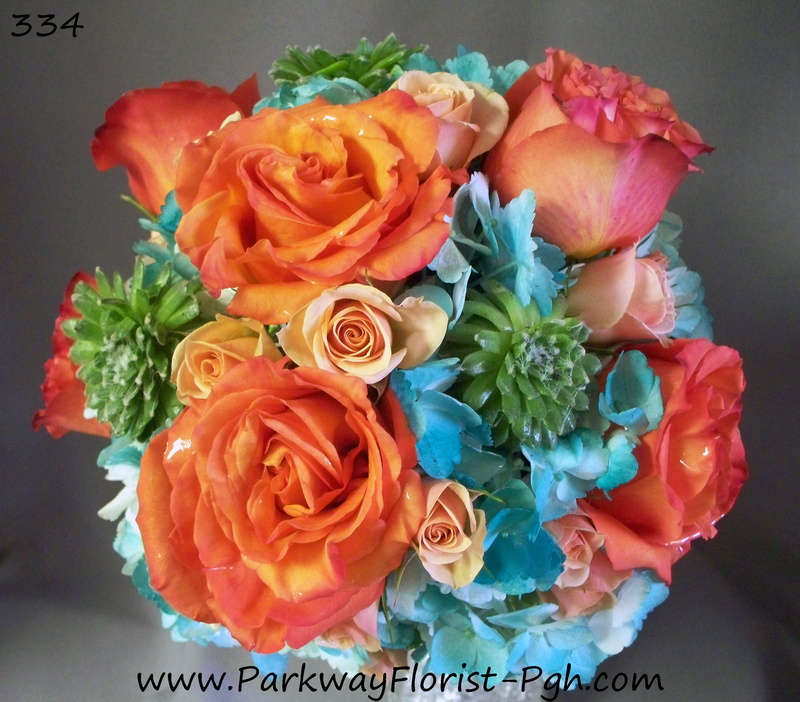 This entry was posted on September 29, 2016, in Weddings - 2016 and tagged blush and ivory, bride bouquet, carnegie museum wedding, dahlias, floating candles, heinz memorial chapel, hydrangea, pink, pitt wedding, pittsburgh, Pittsburgh Wedding, rose petals, tablescape, tablescape wedding, university of pittsburgh wedding, wedding, wedding centerpiece, wedding flowers.